You are currently browsing the tag archive for the ‘discernment’ tag. Like first-century Palestine, the setting for this mandate, our times are rife with turmoil, with reversals in values, with rampant greed, with untoward events that decry expression. Covert and overt oppression hold people hostage. Homelessness, actual or psychological, sours hearts. Indeed, whole cityscapes appear inert, frozen in toxic fears. And Black Friday’s madness launched the shopping craze until the eve of Christmas. This scenario, ramped up by devotees of Evil, continues emasculating spirit, year after year. Yet there is another voice that rings through the centuries: ”Watch yourselves …” To heed its imperative toward conversion of life requires humility, prayer, and selflessness. Through the practice of these disciplines emerge stalwart hearts, clear vision, and unflinching truth. That’s what really matters. But such disciplines are counter-cultural, many protest. I’d much rather hang out with my buddies at the bar or go shopping. That’s where real life happens. Yet the challenge remains: to go apart, alone, in silence, and see whom we meet. It works. It really does. How many doors do we open and close within a given day: to our homes, our cars, to our places of work, to institutions and places of commerce, to homes of friends? Are we aware of the different kinds of doors, hinged, folding, sliding, rotating, up and over, and so many more, some with locks and some without? Does crossing their threshold alter our energy? What or whom are we keeping in or keeping out? Such questions must have influenced the earliest reproductions of both single and double doors depicted upon walls of Egyptian tombs in the Nile Valley. Here, the door symbolizes an area, closed off from the profane, similar to later ornamental doors found on mosques, monasteries, cathedrals, and temples, orienting the worshipper toward its mysteries within. And museums around the world preserve doors removed from ancient Eastern and Western homes. A set of Roman folding doors from a first century AD estate in Pompeii, ruined by Mount Vesuvius, can still be seen in the Archeological Museum in Naples. 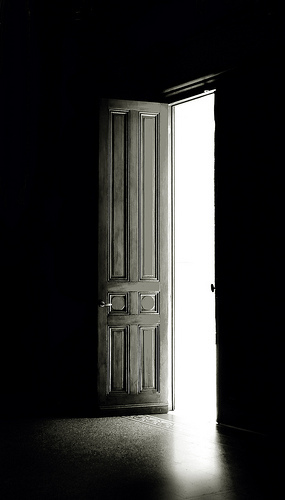 However, there is another door closer to home, the door to our hearts. Its challenge is to pray for discernment, to discipline our instincts, and to savor the new knowledge that crowns this effort. Thus we thrive in our flawed humanness and bring our unique gifts to fruition among others.